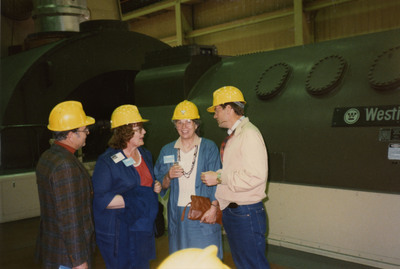 Rosemarie Myrdal, Dagne Olsen, and two unidentified men standing in front of a Westinghouse turbine generator. A Republican from Edinburg, Rosemarie Myrdal represented District 11 (Pembina and Walsh counties) in the North Dakota House from 1985 until 1993 and served as the Lieutenant Governor of North Dakota from 1993 to 2001. Dagne Olsen represented District 19 (Grand Forks County) in the North Dakota House. A Republican from Manvel, she was elected in 1980 and served until her death in 1994.